Hollow cathodes are electron sources used to routinely initiate, sustain, and neutralize plasmas. Hollow cathodes can be used in numerous gas environments over a wide emission range from milliamps to tens of amps, and are a long-life alternative to filament cathodes. Hollow cathodes can be used with DC ion sources, gridless end-Hall sources, ion thrusters, and Hall-effect thrusters. They can be used for plasma environment neutralization, and as plasma contactors on spacecraft to reduce potential differences and inhibit potentially damaging electric arcs. Plasma Controls has a rich history of hollow cathode research and development. We can provide near-cathode measurements of plasma potential, electron temperature, and electron density using several diagnostic tools. We are well versed in both traditional and emerging cathode technologies. A pair of hollow cathodes, designed and built by Plasma Controls and delivered to a customer's site, are each operating of 10 A of electron emission on argon. Ion thrusters are a subclass of propulsion devices in the realm of electric propulsion. Ion thrusters, and other electric propulsion devices in general, operate with better efficiency than chemical propulsion devices. While ion thrusters provide low thrust, they do so at high specific impulse, meaning they provide a large change in momentum per unit weight of propellant. Electric propulsion devices differ from chemical propulsion devices in that the energy used to accelerate the propellant does not come from the propellant itself, but from a separate power source. Plasma Controls has a wealth of experience with government agencies and private sector companies involved in electric propulsion research and development. 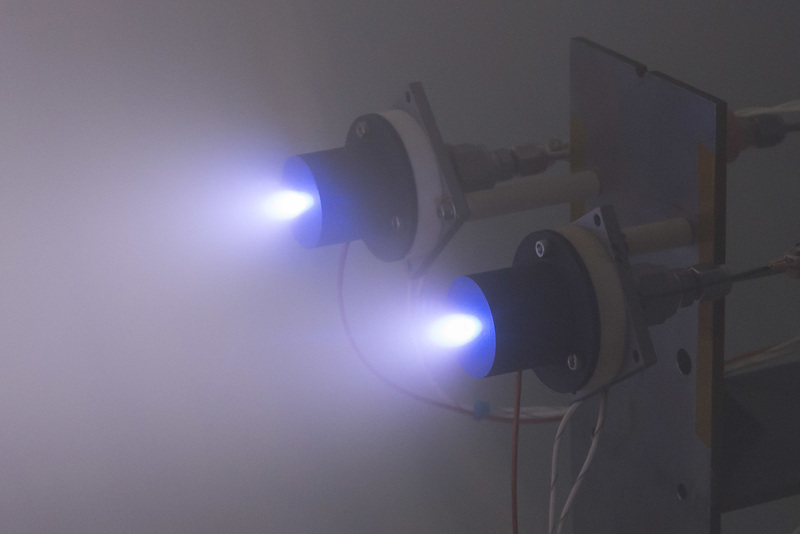 Ion thruster research is a cornerstone of Plasma Controls history and experience. Both experimental and numerical tools are available to customers for research.Positioning systems are used with Langmuir, Emissive, Electrostatic Analyzer, ExB, and Retarding Potential Analyzer tools for experimental ion thruster and plasma source research. Plasma Controls uses the ffx ion optics simulation tool for ion thruster grid development and research work. Additional numerical tools are available for the analysis of sputtered material deposition from target to substrate. Plasma Controls uses the ffx ion optics simulation code for ion thruster/source grid design. The ffx code provides perveance, crossover, electron backstreaming, and grid lifetime predictions. Simulations are done in 3-D and can be performed on two, three, or four grid systems. 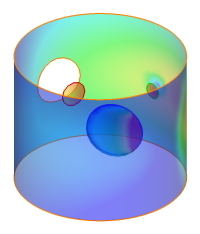 Simulation results from Plasma Controls' ffx ion optics code: ions pass through aligned holes in a two-grid optics system. The ion "beamlets" have different shapes because of variations in plasma density. The ffx code can model grid erosion and make lifetime predictions. Erosion is caused by charge exchange ions that are created in the regions near the negatively biased accelerator grid. This image shows a small section of the grid at three points along its lifetime. This image shows grids that were designed and tested by Plasma Controls. Grids can be "domed" or "dished" inward or outward to give ion beams that are focused, to hit a small target for instance, or unfocused, to cover a large area. Thin film deposition has played a key role in several of our past projects, with widely varying applications. Thermoelectric devices convert temperature gradients to electrical energy and vice versa. When a temperature gradient is applied across an n-type (excess electrons) and p-type (excess holes) material, the electrons and holes at the hot side diffuse toward the cold side, creating a voltage difference. If a circuit is attached, the movement of the charge carriers can perform work. Alternatively, an external power supply can be used to operate the device in reverse as a Peltier cooler, driving heat from the cold side to the hot side. Research in thermoelectrics centers around improving the n- and p-type material’s figure of merit zT, which indicates the maximum device efficiency. Devices with figures of merit of 0.7 are available today, but this needs to be improved to make thermoelectrics competitive in more areas. Plasma Controls has applied plasma techniques, including thin film multi-layer deposition to thermoelectric device fabrication. Generally, thermoelectric device efficiencies are far lower than that of “heat engines” that operate on Rankine or Sterling cycles for example. However, thermoelectrics are solid state devices with no moving parts and are thus are attractive at the milli/micro-watt power levels where standard conversion technologies are difficult to scale down in size. Thermoelectric devices show promise for waste-heat recovery in automobiles and cook stoves, and in air-conditioning to replace harmful refrigerants. 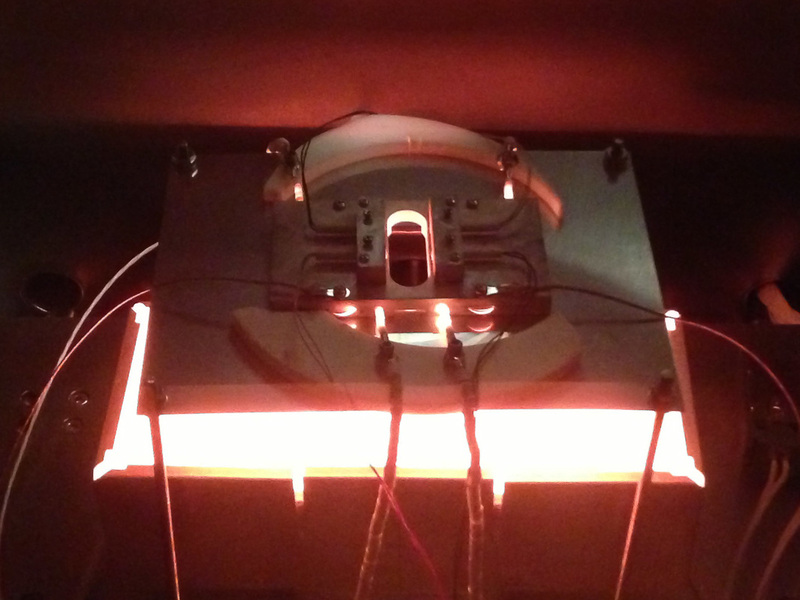 This image shows a TEG test rig that was heated to several hundred degrees Celsius to measure Seebeck coefficient and resistance as a function of temperature. Plasma processing, including both physical vapor deposition (sputtering, ion implantation & deposition) and chemical vapor deposition (metal organic), can be used to improve the biocompatibility and active integration of biomaterials through surface engineering, i.e. the control of surface chemistry and topography through surface treatments and coatings. In past work, Plasma Controls has used thin film deposition to apply hydroxyapatite (HA) coatings to titanium, and studied the biocompatibility of those surfaces. In addition, we have studied the resistance to bacterial growth, with and without the inclusion of antibacterial agents in the coatings. 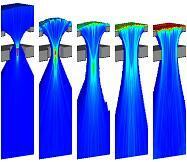 Plasma Controls has modeled sputter deposition, and re-deposition, using its Surface Evolve simulation code. 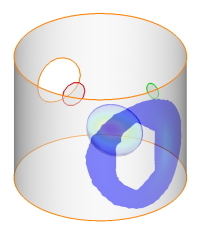 The code can model both stationary and rotational substrates in complex chamber geometries. The image below shows an ion beam emanating from a source (red outline) and striking a target (blue outline). Material is sputtered from the target onto a substrate (green outline), and also onto the chamber walls.